These no-prep sheets provide ample opportunities to practice targeted speech sounds in a play-based activity and can work for one-on-one sessions as well as small groups! 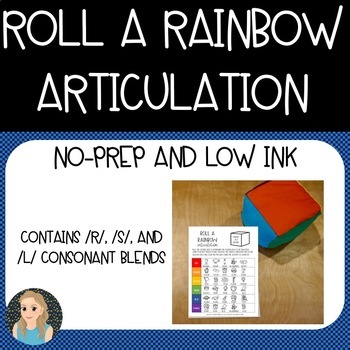 Simply provide each child with the sheet consisting of their targeted speech sound(s) and allow them to roll a plush six-sided colored cube (presently found in the #targetdollarspot) or a box with all six colors represented on its various sides to determine the colored row to be practiced. Using their best speech sounds, have them practice the target words/pictures in the selected row. Continue to take turns with other students until everyone's game board is marked to completion using mini erasers, counter tokens, pom-poms, or by coloring the pictures to indicate game progression. Additionally, game boards can be colored and taken home when the game is complete to promote carryover of practice at home.